Sun Armor | Pro Chem, Inc.
SUN ARMOR is PABA free, water and sweat resistant, and has earned the Skin Cancer Foundation’s approval. This product vanishes quickly into the skin, leaving behind no memory of application. 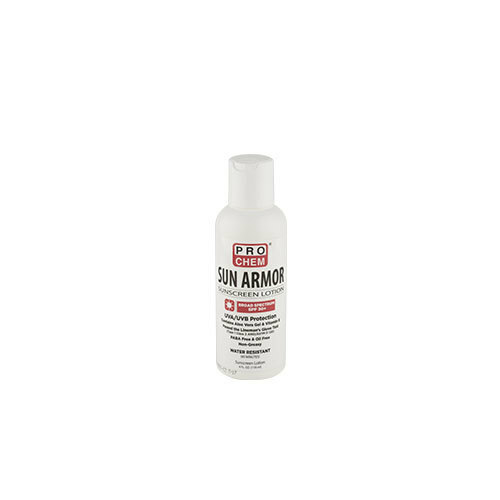 SUN ARMOR sunblock does not sting the eyes and enhances skin texture with aloe vera gel and vitamin E. It is available in a 4 oz. bottle or 500 ml bag for use in the Sun Armor dispenser. The refill bag contains approximately 130 applications. Each application only requires 2-3 pumps to provide enough lotion to cover the face, neck and arms. O.S.H.A. mandates that outside workers must be protected from all environmental hazards.